thank you very much for this useful info. 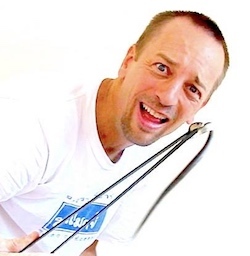 I live in Chiang Mai and it seems that today I caught a Kukri which is not aware about your post here or lost its way. Maybe it was on vacation in the North. Mine was spotted by my dog swimming in a small pond in the afternoon, not in the evening. The pond is sourrounded by low grass and concrete, no thick flora around. After I got it with a snake-catcher it showed perfect defensive behaviour as described in your post. Tomorrow I will make some pictures, then release it somewhere further away into the green. If you want some more pictures please send me a mail. 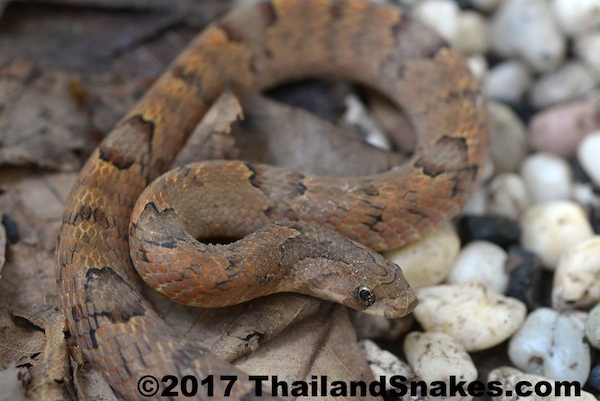 I found two small snakes, one was very little indeed in my garden in Pattay this week. The look like that one, but still lighter. They had a very aggressive behaviour and I really got worried whether they might be little Malayan Vipers. I will try to send the picture I took of one of them (how could I send it? ), which was found by our cat. The other one was under the lit of our water reservoir. When I lifted the lid it was just sitting there. I removed both out of y garden, but did not kill them. 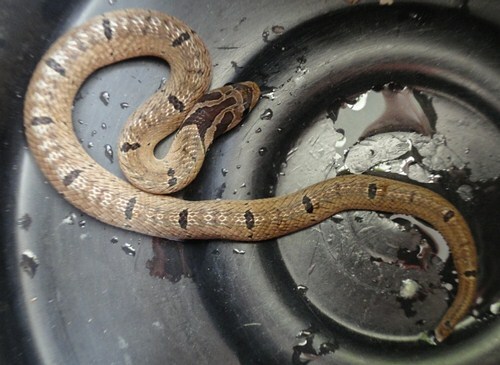 Yes, Kukri snakes – I answered your email. Nice patterns on those. Cheers! Nice info about this great snake. Regarding offspring, then i can informe you that they lay eggs, proberly around 6-12. I have bread them twice now, and my first clutch was 8 eggs (7 hatched) and the second was 10 eggs (all hatched), they hatched after 60 days incubated at 29 degrees celcius. and there egg eating habbit is why they have those enlarged rear teeths, they use them to slice open eggs, put in there head in the cracks they made and drink the egg, also for this reason they can take much larger eggs than there african counterparts who swallow the eggs hole, and then crush them. We live in Chiang Mai and have killed one (oops…thought it could be poisonous until I found this page) and saw another today under some brush in our garden. Seems they really do live up North – and are even out during the cold season! 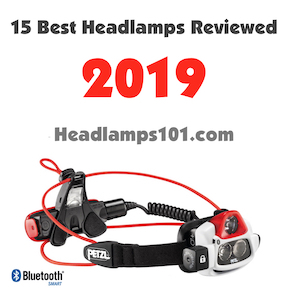 Thanks for your great site. 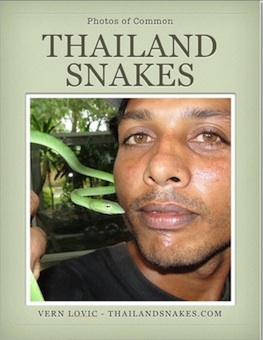 It is my number one resource for my snake FAQ here in Thailand! Thanks for your comment Alina – much appreciated! I have a house in Chonburi about 13 klms from downtown Pattaya. In my time here I have seen quite a few Copperheads and Tree snakes. About a year ago I’m sure I had a cobra in my garden but it disappeared next door. Are cobras common around Pattaya ? Cobras are very common everywhere – the monocled cobras, Naja kaouthia, are all over the country, and in good numbers. 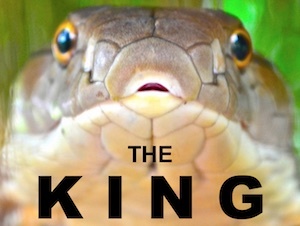 King cobras and the spitting cobras are much more rare. I just saw one of these in my backyard in Chiangmai. It was too quick to escape before I could get a photo of it. The back of the body had light and dark brown stripes along the body. Hi Vern, we got a baby brown kukri. Looks like it just hatched from somewhere. Do you know what kind of place to look for its siblings and mom? We should find them before our dog kills them. I wrote you email. Snakes like to lay eggs at the base of trees. Under leaf litter if possible. Out of the sunshine – would get too hot. In a shady place where nothing is likely to trod and break the eggs. Cheers! Live in northern Thailand outside Uttaradit. Yesterday the wife called out loud for me when she nearly stepped on a brown kukri-it was about 1pm and it was laying on a walk path with small rocks underneath and it was curled up. We used a broom to push it away, and saw the underneath was a white color. It did not seem to want to go away and tried to strike at the broom. After many attempts it finally cooperated to go the direction we wanted(wanted it away so the dogs would not kill it). The funny part was, like I said earlier, the wife nearly stepped on it; and she gave me stern instructions to be more careful after I kicked up a leaf at the 13th tee at Sirikit Dam golf course and found a small cobra underneath the leaf just 5 days ago. Have pics of the two and of some others if interested. Next Next post: King Cobra Hatchling Found – 2017!